Get ready to start questioning everything. UPDATE: READ THE COMMENTS AT THE BOTTOM OF THIS POST AND STOP DRINKING A HELL OF A LOT OF DRINKS! A report out of Australia has shed light on the process of using beef gelatine to clarify fruit juice, much in the same way alcohol is filtered using animal derived ingredients to remove organic matter. The Melbourne-based consumer who uncovered this fact was told by one of Australia’s leading juice companies that all of their ambient supermarket lines used beef and/or alcohol at some stage during their manufacturing process. This is bad news for vegans, vegetarians, consumers following religious food guidelines and anybody who enjoys the odd brush with food transparency. This has got me concerned about what we are drinking in the UK. I intend to chase up as many juice companies as possible here in the UK to see if I can get answers regarding the fining and filtering process of our supermarket brands. But I think I will need to call on UK vegans to help me out as the task feels insurmountable. If you can reach out to just one juice manufacturer and ask them about animal derived ingredients used in their juices, we should be able to cover a huge section of the drinks sold in UK stores. Please post any responses you receive in the comments below so others can make informed decisions on future juice purchases. 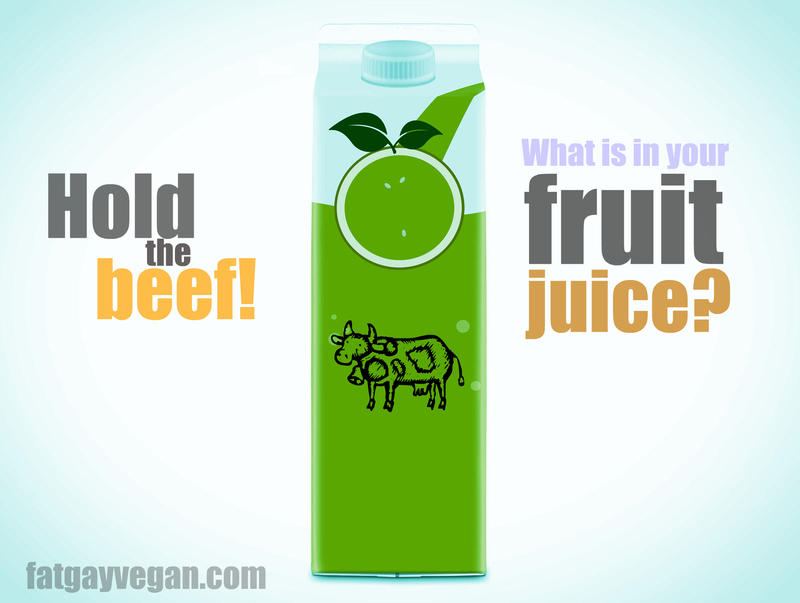 Get the beef out of our juice! Does it say vegan on the carton, M.M.? This is seriously revolting… I mean, I knew this a common practice in the production of some beers and wines, but never thought it would extend to normal juices. I’ll email Innocent Drinks and Waitrose and let you know when they get back to me. Innocent drinks are not suitable for vegans, that one was in the news a couple of years ago. How come? Most of their products are labelled suitable for vegans. Is that not the case? why’s that? and is that still the case today? Actually you’re right, I literally obsessed over this and went to a supermarket to confirm. Innocent juices arent labelled as vegetarian let alone as vegan. I had this idea as their food is now suitable for vegans, which made me think the juices would be as well. Also in their FAQ, they mention they cannot guarantee their drinks are suitable for vegans because some fruit might contain shellac which is used during shipping it seems. Wouldn’t it be a good idea to start a petition demanding the listing of animal-derived ingredients in the process used in the process/manufacture of drinks/food? Surely someone may have tried this before, but now that this is in the news it might get more people on board! Thanks so much for taking the time to get in touch. Rest assured we don’t use any animal products, such as gelatin, to clarify our juices or ingredients. With that said there is a very small chance that a tiny (and we mean tiny) quantity of shellac could be present in some of our smoothies and our juice. You might already know this but shellac is an ingredient used in fruit waxes. Most fruit sold fresh is waxed as it reduces moisture loss and extends the life of the fruit. As we sometimes use freshly squeezed lemon and lime juice, I’m afraid we can’t guarantee that our drinks are shellac-free. We’re really sorry about that but if you have any more questions feel free to give me a shout. “Further to our last email Rita, I’ve spoken with the buyer from our Juice department regarding your query about animal derived ingredients used in our Juices. I’m glad to say we’ve received a prompt response. They’ve looked into this and can confirm that we do not use animal derived ingredients in our chilled fruit Juices. I hope this has resolved that part of your query and we appreciate your patience while we get this information for you. On a similar note, the Co-op have a note on the back of some of their juices, saying ‘Not Suitable for Vegans’ with an explanation that animal wax is used to preserve the fruit during shipping. The more you know, the more you need to know! “Thanks for your email. Rest assured, we do not use animal products to filter our juices. It seems to be incredibly hard to know exactly what goes into food products these days – So many go through such long complicated processing procedures. I’ve just messaged Cawston Press so will update once I get a response – fingers crossed, I bloody love their Apple & Rhubarb! Swift response from Britvic below. I think the first bit about ‘animal extracts’ means no actual animal-based ingredients or flavouring. Items used as part of the processing (eg gelatine or bonemeal used as a fining agent) are classified separately & don’t have to be declared on the ingredients list. We would like to confirm that none of our products contain animal extracts of any kind. I can however confirm that only one Britvic product contains alcohol, Shandy Bass. All other Britvic products are suitable for vegetarians and vegans, a full list of which can be found on our web site http://www.Britvic.co.uk. I’ll post any more answers I receive. It says vegetarian on the Purdeys bottle! This is confusing! For the vast majority of our drinks, yes. None of the Coca‑Cola and Schweppes brands contain milk, eggs or any products derived from mammals. However, vegans and vegetarians should note that a few of our drinks contain small traces of fish gelatine, which is used as a stabiliser for the beta-carotene colour. These products are Lilt, Lilt Zero, Kia-Ora Orange Squash No Added Sugar and Schweppes Orange Squash. Five Alive Apple Five Fruit Blend also contains traces of gelatine. Are Coca‑Cola brands suitable for vegetarians? None of our UK soft drink brands contains ingredients derived from mammals or poultry. However, it’s important to note that some of our products contain minute traces of fish gelatine, which is used as a stabiliser for the beta-carotene colour. These products are Lilt, Lilt Zero, Relentless Inferno, Kia-Ora Orange Squash, Kia-Ora Orange Squash No Added Sugar and Schweppes Orange Squash. Five Alive Apple Five Fruit Blend also contains traces of gelatine. We also don’t conduct any animal tests or fund animal tests in developing our soft drinks, except as may be necessary in some countries to fulfil government requirements for proof of ingredient safety. The problem with manufacturers answering this question is that they only consider if a product contains animal ingredients, but not if an ingredient has been tested on animals (such as artificial sweeteners in diet sodas). This whole thing with gelatine-clarified juice has got me thinking. What about products that use juice as an ingredient? Do the makers even know? Would they even think to check if the juice was processed this way? Would an ice lolly manufacturer even know/care to check that the juice they used was filtered? Tarts? Cakes? Sweets? Juice manufacturers are not required to list these ‘process’ ingredients so how would anyone be expected to find out? They should know. Co-op for Eg, they look end to end at the supply chain and know the entire process from a technical point of view for all ingredients. Think back to horse meat though. Everyone thought they had done enough checking and it was beef… But it turns out it wasn’t. Maybe if enough of us emailed the most obvious products containing juice like lollies as a start & ask where they source their juice from & make them do the homework? Other thing is to find out what requirements they need by law to label their food as vegan. How far back in the supply chain does that need to go? I have also contacted ASDA about their fruit juices, will report back when I hear from them! Thank you for taking the time to contact us. Please rest assured that we do not use gelatine from animal sources in our manufacturing or filtering process. I hope that this information has been useful to you. “Thank you for your email and your interest in our drinks. It is indeed a minefield. I wonder if all of these juice companies who claim their products are vegan know whether or not the sugar that they buy to put in them was made using bone char (burnt cow bones – http://www.vrg.org/journal/vj2007issue4/2007_issue4_sugar.php)? Bone char is a fun one, it is even used to purify drinking water in some developing countries. So my personal conclusion.. as repulsive as it sounds, there’s no way of avoiding animal products, there’ll always be something snuck in somewhere that isn’t covered by labelling laws, even something as simple as buying clothes that have been washed in something that contains lanolin. More examples here: http://www.ted.com/talks/christien_meindertsma_on_pig_05049. So what can you do? Just do what you can do I guess, make the day to day decisions that make you comfortable and don’t beat yourself up for missing out on something that’s hidden away somewhere you don’t know about. hah right on topic, at 5:12 into her talk she talks about gelatin being used to clarify fruit juice. The above have been processed in part with fish gelatine. ‘We get asked about this reasonably regularly and happy to detail as follows. In the interests of openness I’ll confess to a degree of bias on this subject, as I’m a vegetarian! We specifically require all of our raw materials suppliers to use materials that are entirely suitable for vegetarians and vegans, including a ban on the use of gelatine, isinglass, egg albumen and similar process aids for clarification, and also e.g. shellac based fruit waxes. Most modern equipment used to clarify juices is based on filtration processes, but we are aware of a number of production sites still using e.g. pork gelatine for this purpose. It’s worth noting that many countries have a very different view of this – for example, we have spoken with several manufacturers in Europe who take the view that, as the added gelatine or similar is subsequently removed, the finished product is suitable for vegetarians. This is however not a view that we would share, and indeed we believe that for a product to meet customers’ expectations of suitability for vegetarian and vegan diets, both the product itself and the entire production process must be completely free of animal derivatives. They aren’t allowed to use such ingredients if they are labelled as suitable for veggies and/or vegans but there are two exceptions for those foods unlabelled sfv, and they are ingredients use in alcohol to clarify and those used for beta carotene and vitamins. Thank you for your patience while I looked into your email. On this occasion, I am unable to check all of the items you have sent into us. I am sorry to disappoint you. Although, I can provide more information about the ingredients we use in our juice drinks. In our Sainsbury’s own brand drinks, we would only use the vegan logo if nothing in this product contained ingredients from animal sources, or if these had not been used during the processing. We do have a juice product which is not suitable for vegans, this is because it contains condensed milk. Following this, I can advise that if the product does not have the vegan label on the packaging, then this is not suitable for vegans. I have copied a link below for our website, providing more guidance on vegan labelling, I hope this is useful. http://www.sainsburys-live-well-for-less.co.uk/recipes-inspiration/healthier-eating/health-advice/health-labelling/vegan-and-vegetarian-product-labelling. Some of the flavourings used across our range will be on an alcohol carrier. This is normal for the majority of the flavourings, however is in an extremely low percentage. An example would be, the alcohol content of a flavouring may be 40%, however the flavouring is in the product at <0.05%, therefore the total alcohol percentage will be at <0.02% in the total recipe. You can find this information on the ingredients list for our own brand products. We do encourage our customers to check the labelling before buying our own brand products, so they can make an informed decision about the food they buy and I hope you are able to find something suitable next time you are in store. We appreciate you taking the time to contact us regarding this and we are looking forward to seeing you in store soon. Our drinks are suitable for vegetarians and vegans and they are all gluten free. We do not use any animal products in the making of our drinks. Thank you for visiting the Monster Energy Website. We use no animal bi-products in any of our Monster Energy products. However, Java Monsters are dairy based. I did ask if they use any bi products in the making of their drinks so I am guessing that they mean that as a no. “Thank you for your recent email. Copella Juice are suitable for Vegan. I hope this helps and thank you for contacting us. A few years ago, I had a long conversation with someone from The Vegan Society about what fruit juices would invariably be vegan. The gelatine issue is typically a problem for clarified fruit juices. And other animal-based products, such as isinglass, could also be used instead for filtration. Whereas the shellac issue is typically a problem for shiny / citrus fruit. Why is Purdeys not vegan?